SDCC 2018: comiXology Originals reveal – Monsters will rise, and stone kings emerge – AiPT! comiXology unveiled a slew of exclusive comics at SDCC, featuring work by Mike Norton, Tim Seeley and more. comiXology kicked off the week of big reveals at San Diego Comic-Con just hours before preview night opens its doors on the biggest comic book convention of the year. Opening up the panel was comiXology’s CEO, David Steinberger, who detailed how the company has been changing the game with over 10 years in the industry backing it up. In its push to publish new original series, Steinberger pointed out all of these series were free to read on Prime Reading, Kindle Unlimited and Comixology Unlimited. Four of the titles are available on comiXology right now: Goliath Girls by writer Sam Humphries and artist Alti Firmansyah, Grave Danger by writer Tim Seeley and Mike Norton, Hit Reblog: Comics That Caught Fire by writer and artist Megan Kearney, along with over a dozen webcomics superstars and editor, Hope Nicholson, and Teenage Wasteland by writer Magdalene Visaggio and artist Jen Vaughn. Sam Humphries described Goliath Girls as “Pitch Perfect meets Pacific Rim.” The series is drawn by Alti Firmansyah and, to the great surprise of the audience, will be released simultaneously in Japanese in Japan and Worldwide. Next up was Hit Reblog edited by Hope Nickolson. The book showcases 20 true stories behind the most famous and viral comics told in illustrated form by Kearney. The stories are meant to show “ways sudden fame affected these people,” Kearney said, and it allowed her to flesh out and reveal more about these creators. Teenage Wasteland was the fourth book now available on comiXology with writer Magdalene Visaggio and artist Jen Vaughn in attendance to talk about the book. They described the series as relatable to anyone who is trying to build a life for themselves and for people who want to live a fuller life. Next up were titles to be released sometime in the future. Creators for three of the books came to the stage. Writer Mark Sable and artist Kristian Donaldson spoke to their 120-page graphic novel The Dark. Sable revealed the idea for The Dark came from his time working for a think tank The Art of the Future, which conducts research to prevent future wars. The title takes place after a worldwide cyberwar ends technology as we know it and a former super-soldier teams up with a biopunk to fight the rise of a biological internet forcing humanity to connect to it. Donaldson spoke to his rendering of the environments in this post-apocalyptic world and how he actually rendered them all in 3D to better explore them. When the door to a living dungeon surfaces in the tiny hamlet of Oddgoat, village girl Temerity Aster has two choices: abandon the only home she’s ever known to carpet baggers and sellswords or carve out a place for herself and her family in the new and dangerous world of delving. 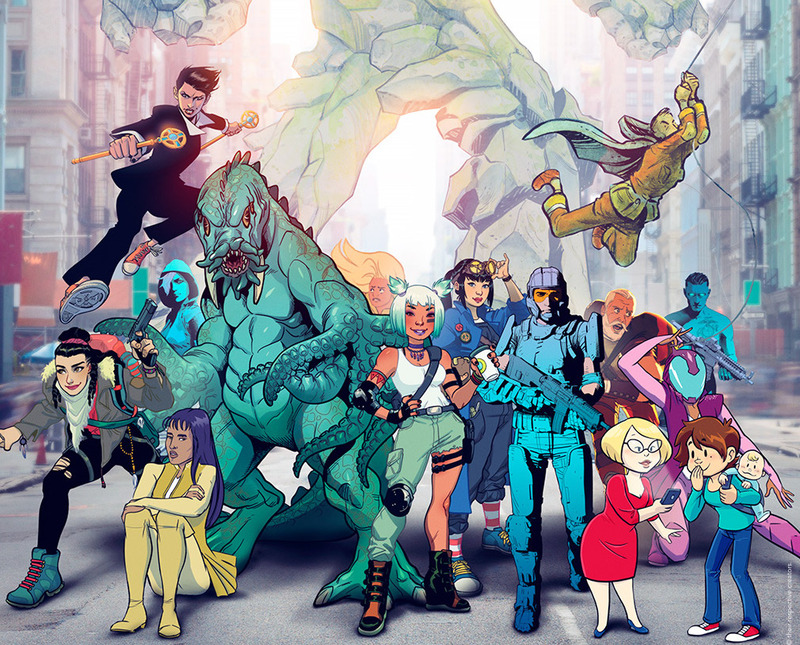 comiXology is looking for comics that may or may not be supported in the retail marketplace. Creators are given support to better utilize the Guided View comiXology technology and optimize the reading experience. After an audience member asked if any of these titles were in the process of or being looked at to be adapted into Amazon Prime TV or movies Head of Content, Chip Mosher answered they don’t have anything to report on that at this time. The audience reaction to that answer seemed to suggest otherwise.